Gain Red Lion Col and then cross shingle and find a line through the bluffs in gullies on the County side. Above, long easier snow slopes lead up the ridge. The ridge then narrows, offering an exposed scramble on snow or very loose rock to the summit. This summit ridge (called the Southern Cornice in past accounts) can be tricky under snow, with significant cornices. This route offers a direct approach from the Bracken Snowfield, though the rock is quite poor in places. 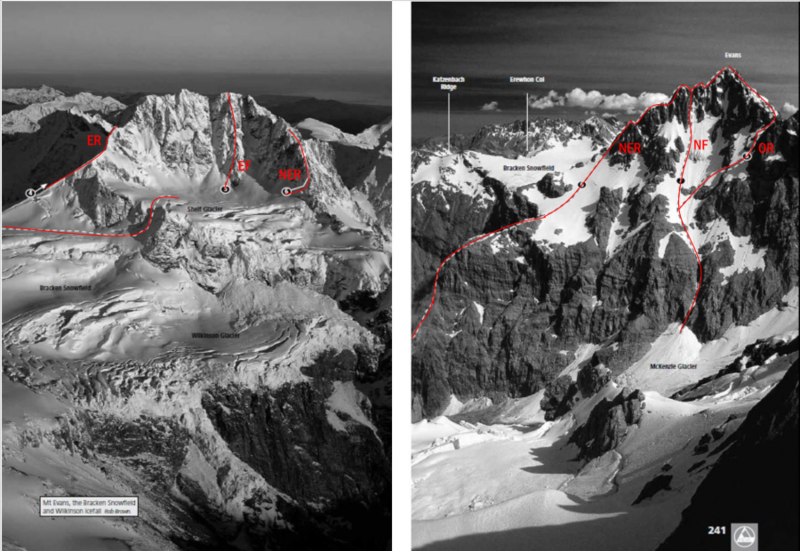 A snow arête gives way to a narrow ridge of loose rock and pinnacles, another snow arête and then some gendarmes. A variation, keeping to snow on the south side before the crux, has also been used. The section from the East Ridge up steep, loose rock flanks to the West Ridge is normally the crux. A classic route. Reach the Shelf Glacier from the Bracken as described in East Face. 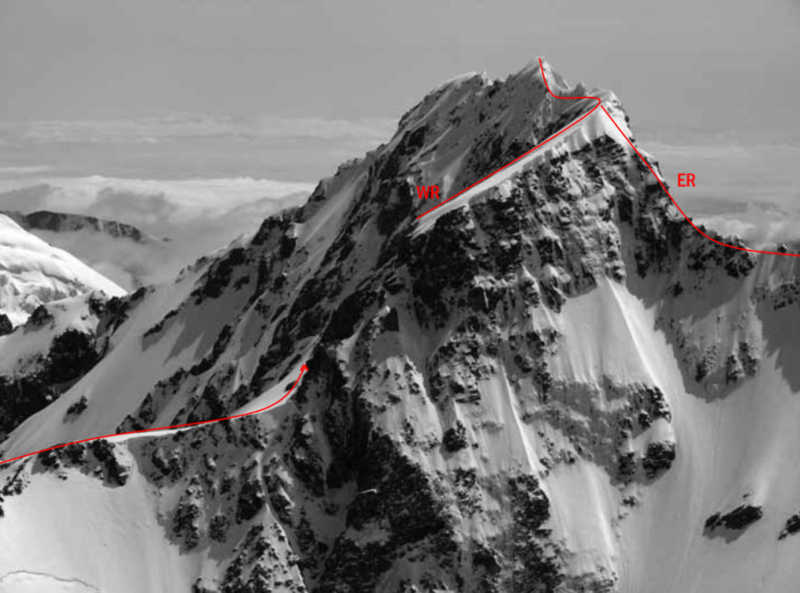 Alternatively, from the Wilkinson Valley, climb the lower section of the ridge keeping to the McKenzie Glacier side. There are five rock steps and gendarmes, mainly on firm rock, and where the climbing becomes too severe alternatives usually exist on the McKenzie Glacier side. The final rock section leads to the junction with the North West Ridge and a traverse over the north summit to reach the high peak. 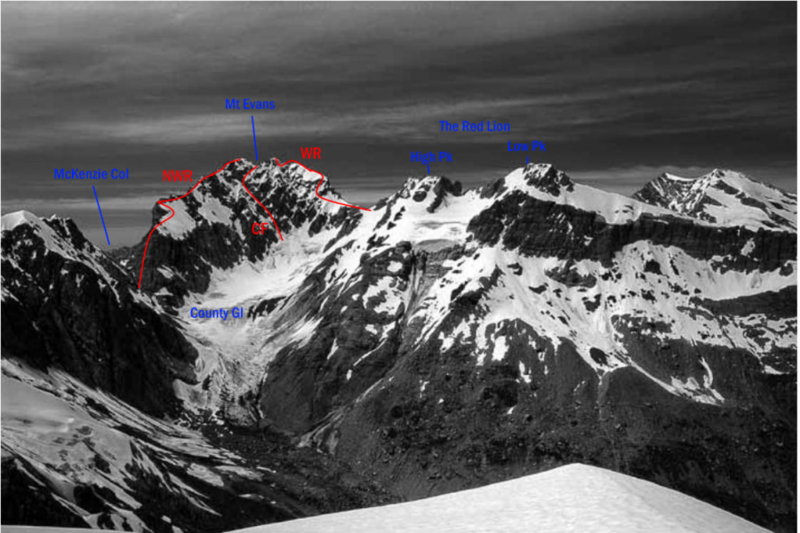 From the upper McKenzie Glacier, climb rock slabs, snow slopes and couloirs on the North Face to join the North West Ridge at about 2400 metres. Access to MacKenzie Col is best from the Wilkinson side, earlier in the season. On the County side the couloir is narrow and more subject to rock fall. Begin up steep and fairly rotten rock, passing a prominent finger of rock on the McKenzie side and a rock tower on the County side. Three rock steps are more challenging, particularly the second one. Less than 100 metres from the junction with the North East Ridge, the ridge steepens and the first ascent party was forced to bypass this up a snow gully to the climber’s right. Loose rock leads to the high peak (or sidle well down on steep snow to avoid cornices). From the upper County névé, negotiate big schrunds to access the main gully at about J34 411783 / BW18 311 167. Generally the route follows up the middle of the face with a mix of loose and reasonable rock, snow patches and a long snow couloir between two rock ribs. Loose rock to the right completes the climb, reaching the summit ridge about 30 metres left of the high peak. Not excessively difficult climbing but sustained and moderately exposed. The route has variable greywacke, best approached when there is still snow in the gullies.